When paired with the coordinating cling stamp set, the indulgent die cuts created with the Sweet Shoppe Treats Die become the “frosting on the cake” and are ideal as dimensional embellishments on all occasion greeting cards, scrapbook layouts, or altered art pieces celebrating those special friends and loved ones who have an insatiable sweet tooth! These fresh-baked and confectionery accents coordinate beautifully with the Sweet Shoppe Cling Stamp Set and Die, allowing you to design your very own bakery cart display to use as focal points on all of your paper craft creations! 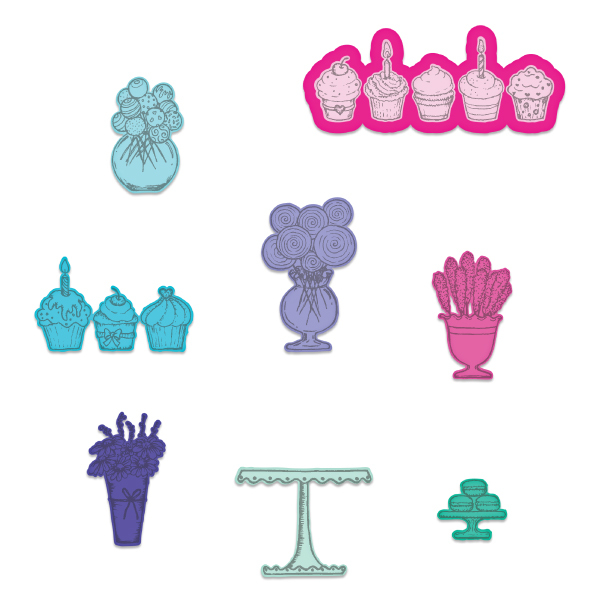 These dies are part of the Sugarspun Collection and pair with Sweet Shoppe Treats Cling Stamp Set.